Solaire of Astora is a Warrior of Sunlight who appears throughout the world. He is a jolly and strong knight. He even claims of choosing to become undead so that he could search for his own sun. Solaire can be summoned to help you with many boss fights. If he survives the fight, he gives you a Sunlight Medal. But if he dies during the fight, you do not receive the medal. Gifts you White Sign Soapstone the first time you meet him. Talk to him several times. Helps you in various boss fights. To summon Solaire, the player has to be in Human form. 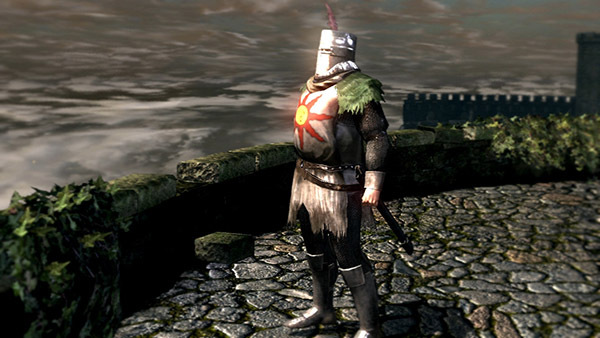 A Golden Summon Sign (Warrior of Sunlight's summon sign) will be located right before a Boss' white fog door, allowing the player to summon Solaire. Glitch (Xbox 360) (Xbox Live Marketplace version): When you summon Solaire before the Bell Gargoyles' door, and use him to kill other enemies in Undead Parish, Solaire will NOT follow you through the fog door. Combined with the Knight Lautrec not appearing glitch, this makes for a difficult situation best avoided, unless you want a challenge. These are the various encounters with Solaire, you have to talk to him in this particular order to be able to Summon him at the final boss fight of the game. You'll first encounter Solaire in the Undead Burg. He is in the area at the opposite end of the bridge on which the Hellkite Dragon is perched. Talk to him at the bridge and accept his offer in order to get a White Sign Soapstone for online multiplayer play. It is possible that he disappears after you defeat the Bell Gargoyles. If this occurs, quitting the game and coming back will return him to the same area. This one is optional and won't break his path through the game. After leaving Anor Londo, go to the Sunlight Altar in Undead Parish, and speak with him there. The Sunlight Altar is located to the right of the bonfire in the Undead Parish, right below the Hellkite Dragon's perch. The altar itself is in the area to the right of the bonfire where a broken statue is located. Go to that area and speak with Solaire who may prompt you to join the Warrior of Sunlight covenant should you meet the requirements for it. After the Centipede Demon boss fight, Solaire can be found in Demon Ruins, sitting near the bonfire after the boss room. You don't actually need to talk to him here, and several steps from Solaire is already Lost Izalith. Entering Lost Izalith here will make Solaire attack you in front of the Bed of Chaos boss fog if the red-eyed chaos bug is still alive. After killing Centipede Demon, go back and head to the Chaos Servant shortcut instead. This shortcut can be found right before the Demon Firesage boss room by climbing down some large roots you can access through the large hole in the wall. In order to open this doorway, you must be a Chaos Servant +21 and then must touch the door itself. Be wary that if you kill The Fair Lady before you activate the shortcut, it will not open for you. There are nine Chaos Bugs in the shortcut area: eight normal, respawning ones, and one with glowing red-eyes. The red-eyed bug will drop a Sunlight Maggot when killed, and will not respawn; this one will need to be killed to prevent Solaire from going insane. If you return to the shortcut door after reaching Lost Izalith, Solaire will be waiting on the ground outside the door. He will be depressed over his quest for his "sun". Speaking with him here will allow you to summon him to help you during the final boss fight with Gwyn, Lord of Cinder. Enter Lost Izalith by crossing the lava pools after the Centipede Demon Solaire goes insane and attacks you near the door to the Bed Of Chaos Boss Fight. Enter Lost Izalith via the shortcut, but do not kill the red-eyed Chaos Bug Solaire goes insane and the next time you visit the shortcut area, he can be found there, hostile. Enter Lost Izalith via the shortcut, kill2 the red-eyed Chaos Bug, and pick up the Sunlight Maggot Solaire shows up as normal (albeit depressed) just outside of the shortcut door and you can talk to him to trigger his final Summon Sign. Do like the one above (up to find the Sunlight Maggot), but reach Kiln of the First Flame without speaking to Solaire before Lost Izalith Solaire's final summon sign does not appear. If you reach Lost Izalith without killing the red-eyed Chaos Bug, Solaire will appear near the shortcut door (It does not matter if the shortcut has been opened or not) wearing the Sunlight Maggot. The sunlight maggot within the Chaos Bugs has burrowed into his mind; it has baited him into forfeiting his soul with the lure of his own personal sun. He is driven insane and presumably hollow upon being vanquished (he can still speak and does not have the Hollowed appearance, although this is maybe just the first step of going Hollow). This is one end to the story of Solaire. It is possible to kill the required Chaos-Bug without opening the shortcut first if you use Poison Mist, Toxic Mist, Dark Fog or the White Dragon Breath through the door. The two-handed strong attack of the Dragon Greatsword also works, as it can go through the door, and can be done several times in a row without breaking the sword. To do this, stand directly up against the Demon Ruins/ Lost Izalith shortcut door and cast one of the aforementioned attacks. You will not be able to lock on to the enemy, but you will be able to see its health drained if it is hit. Only the red-eyed Chaos Bug needs to be killed. The red-eyed Chaos Bug gives more souls than the regular bugs (the only bug to reward 100 or more souls regardless of which New Game Cycle you're in), which is a good indicator of whether or not you killed the correct Chaos Bug on the other side of the door. The Sunlight Maggot will still be there, on the ground, until you pick it up later. You can reach his position by crossing the long bridge out of Lost Izalith that has the extremely powerful Prowling Demon on it. If you rewarp or reload, he should be sitting just pass the shortcut door (entering from either direction). Alternately, do not speak with Solaire in Anor Londo and go through the rest of the game without him appearing at any of the other locations nor being able to summon him. When you reach Lost Izalith and go to the Chaos Bug area Solaire will not be there. Dispose of the bugs and return to Anor Londo and he should still be at the bonfire by the spiral stairs. Speak to him here, then the bonfire right after Centipede Demon. You may now head through Lost Izalith back to the Chaos Bug area and Solaire should be sitting on the ground. An additional way to save Solaire is, after killing the Centipede Demon, hit Solaire to make him hostile ( Don't kill him) and proceed through Lost Izalith normally. NPCs who want to kill you will stay at the spot you hit them and will NOT progress in their storyline. You can proceed through this area and reach the red-eyed Chaos Bug without opening the shortcut. Solaire will not be there. Then you can simply kill the required Chaos-Bug and request absolution from Oswald of Carim. Solaire will not go insane, and his story can proceed normally. Equipped with a unique version of the Iron & Sun Set which contains no item names or descriptions and cannot be equipped on female characters. Sometimes Solaire still goes insane even if you kill the red-eyed Bug. If this happens to you, Solaire is lost this playthrough. Earlier reports suggest that you should kill all the bugs if you want to save Solaire, but this method is not 100% guaranteed to work either. Requesting Absolution from Oswald of Carim does not work. Just try again next playthrough with whatever method you feel best and hope the bug doesn't trigger. To avoid the glitch it's suggested that you kill the Chaos Bug with the Sunlight Maggot BEFORE going through the Fog Door to the Firesage Demon. Either by opening the shortcut door with the Chaos Covenant method, or the Mist/Fog Method. Ah, hello! You don't look Hollow, far from it! I am Solaire of Astora, an adherent of the Lord of Sunlight. Now that I am Undead, I have come to this great land, the birthplace of Lord Gwyn, to seek my very own sun! … Do you find that strange? Well, you should! No need to hide your reaction. I get that look all the time! Oh, ah hah! So, I didn't scare you? I have a proposition, if you have a moment. The way I see it, our fates appear to be intertwined. In a land brimming with Hollows, could that really be mere chance? So, what do you say? Why not help one another on this lonely journey? This pleases me greatly! Well then, take this. We are amidst strange beings, in a strange land. The flow of time itself is convoluted, with heroes centuries old phasing in and out. The very fabric wavers, and relations shift and obscure. There's no telling how much longer your world and mine will remain in contact. and engage in jolly co-operation! Of course, we are not the only one engaged in this. But I am a warrior of the sun! Spot my summon signature easily by its brilliant aura. If you miss it, you must be blind! Not to worry. I do not wish to impose. I was in the wrong. We'll laugh it off, shall we? You've been quiet these days. Anytime you see my brilliantly shining signature, do not hesitate to call upon me. You've left me with quite an impression. I would relish a chance to assist you. You really are fond of chatting with me, aren't you? If I didn't know better, I'd think you had feelings for me! Oh, no, dear me. Pretend you didn't hear that! I'm glad to see you alive. … You have done well, indeed you have. You've a strong arm, strong faith, and most importantly, a strong heart. I am in awe, really. What do you think? Why not join me, as a warrior of the Sun? Righteous knights, guardians of all that is good, in the name of the Lord of Sunlight! … Only if it would please you, of course. Well? Oh! Magnificent! I knew you would fancy it! And there we are. Now just say a prayer at the Altar of Sunlight, right there. Then you shall know the brilliance of our Sun. Yes, well, each has one's beliefs. But if you change your mind, the offer is open. What is it? Have you changed your mind about my offer? Exhilarating, is it not? The power of the Sun! I am blessed to have found such a brave companion! Hmm! Ah, oh… hello there. Forgive me, I was just pondering… about my poor fortune. I did not find my own sun, not in Anor Londo, nor in Twilight Blighttown. Where else might my sun be? Lost Izalith, or the Tomb of the Gravelord… ? But I cannot give up. I became Undead to pursue this! What if I am seen as a laughing stock, as a blind fool without reason? Well, I suppose they wouldn't be far off! Was it all a lie? Have I done this all, for nothing? Oh, my dear sun… What now, what should I do…? If a stubborn beast you be, I have no choice! A Warrior of the Sun will not just sit and take it! 1. To reach this level, you must feed The Fair Lady 30 Humanities. 2. Killing the red-eyed Bug is a trigger itself. If you're in a New Game Plus and have a Sunlight Maggot from a previous playthrough, but you progress up to this point without killing the red-eyed Bug, Solaire will still be hostile.